EY’s 2017 Global Hedge Fund and Investor Survey shows a major increase in the percentage of hedge funds adopting alternative data into their investment process. The trend is supported by increasing expectations of alternative data usage by investors in hedge funds. A copy of the report can be obtained here. 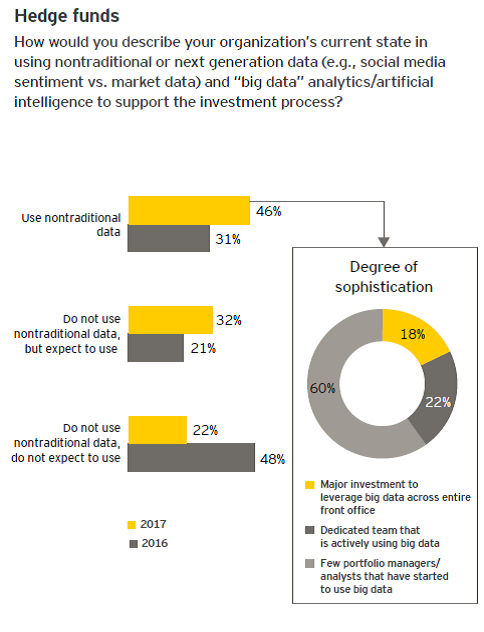 Nearly half of hedge fund managers in EY’s survey last year said they did not use and did not expect to use alternative data in their investment process. 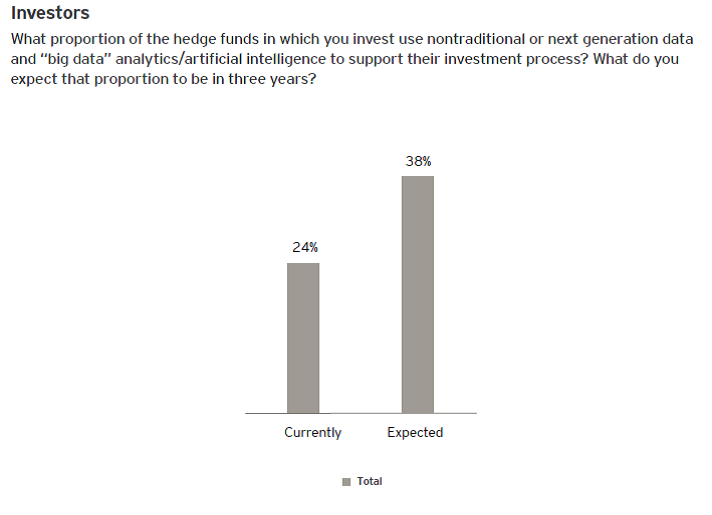 In this year’s survey, 78% of hedge funds currently use or expect to use non-traditional data. Active users have increased from 31% to 46%, as usage has expanded beyond quantitative hedge funds to more fundamentally oriented long/short equity funds. 60% of active users have limited adoption to a few portfolio managers or analysts who have started to use alternative data. EY expects “continued evolution and sophistication around how managers incorporate big data” as more hedge funds create dedicated alternative data teams and leverage data across their platforms. Social media and private company data are the most commonly used types of alternative data, followed by credit card data and supply chain analysis. The biggest challenges for hedge funds using alternative data were onboarding and managing data, followed by finding data that provides value. EY said that hedge funds would also need to navigate potential legal issues around data ownership. Hedge fund investors are supportive of increased alternative data usage by hedge funds. Investors estimated that a quarter of the hedge funds in which they invest use alternative data and expected that portion to increase to 38% over the next three years. The EY survey confirms the broader usage of alternative data beyond quantitative investors. Adoption appears to still be relatively early stage, with most hedge funds seeing limited use by a few PMs or analysts. As more third party vendors offer services which ease the onboarding, management and analysis of alternative data, the barriers to entry are falling, making it more cost effective for asset managers to utilize alternative data. We expect future surveys to show increased adoption across a broader set of hedge fund types and asset classes.